Convergence from FLOATING POINT COLLECTIVE on Vimeo. 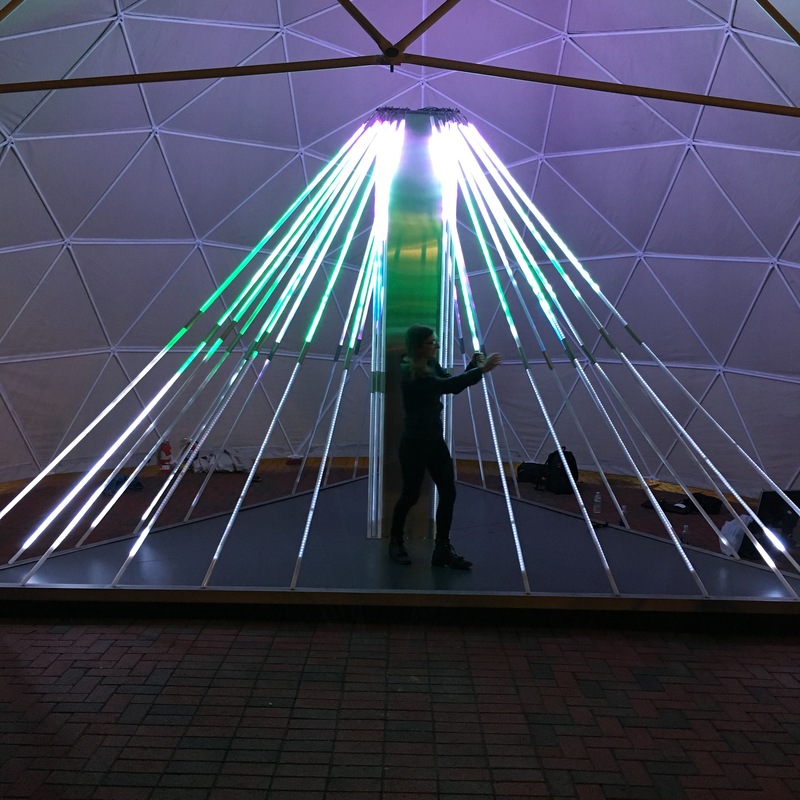 In 2016, Floating Point Collective was invited to build an installation for the annual MoogFest music festival in Durham, North Carolina. 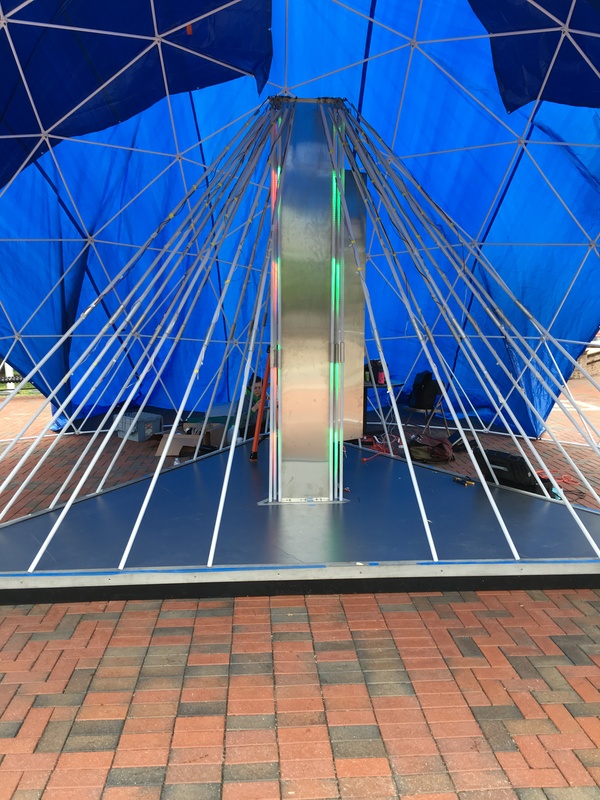 Convergence, the resulting sculpture, was installed for the weekend of the festival in CCB Plaza, and was then moved to Research Triangle Park for the remainder of the year. 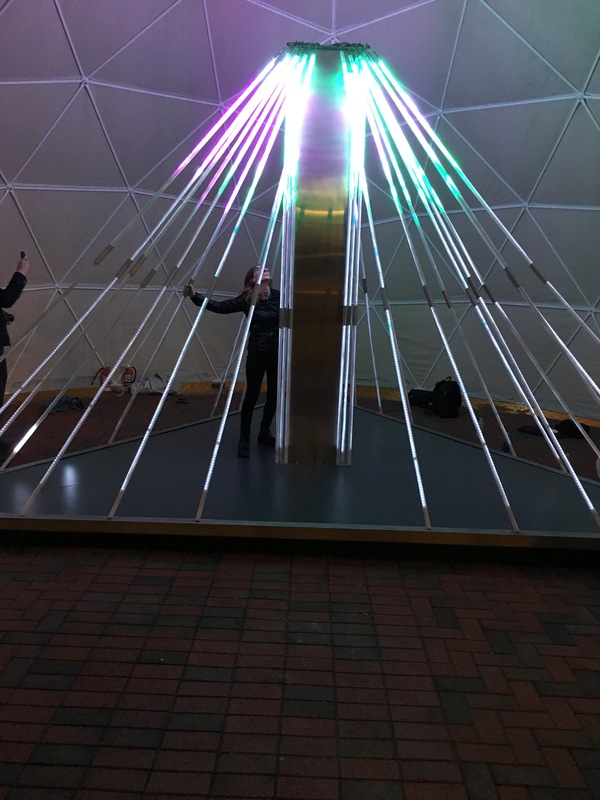 The design for Convergence was inspired by the work at Research Triangle Park - different people from different fields coming together to create new and powerful ideas and industries. 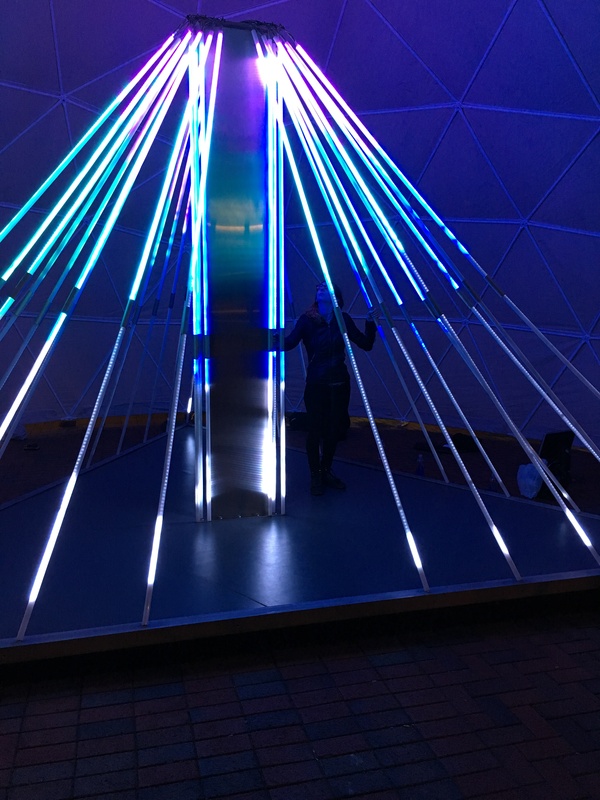 The idea we ultimately agreed upon was to build a pyramid of LED rods that would display a particle animation. Each rod would have a capacitive touch sensor that would change the animation from that point in the pyramid. The colors in the animation represent different fields at RTP, and the interaction represents the resulting ideas that can come out of combining these fields. 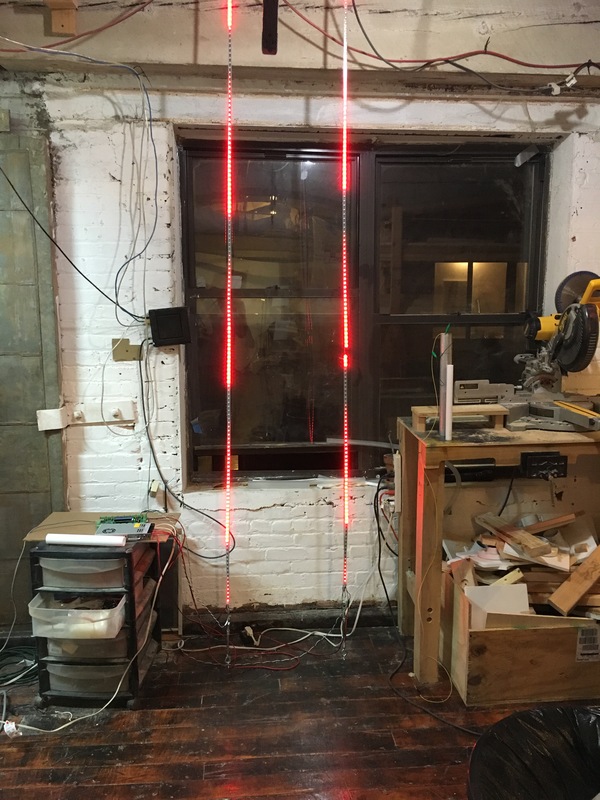 We set up two strips of WS2812 LEDs in our studio and started programming them with different LED controllers. 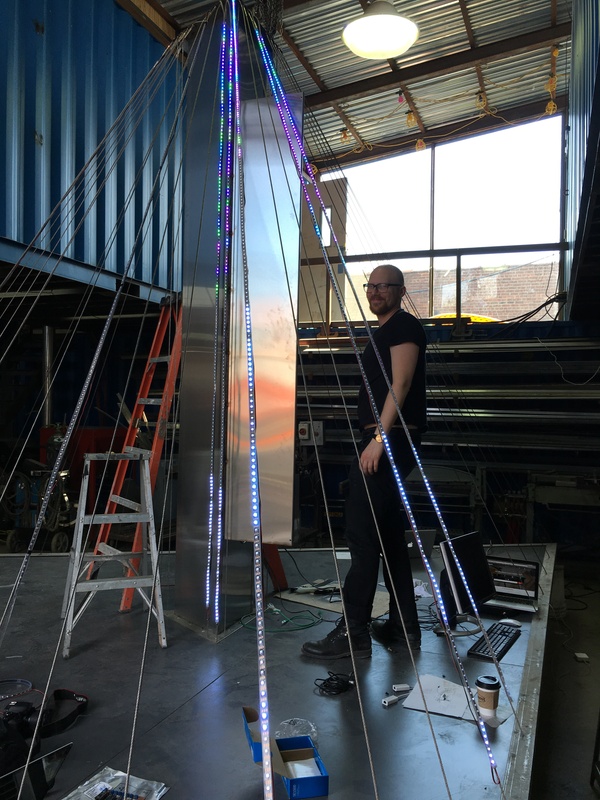 We settled on the Holiday Coro Alpha Pix 16 DMX controller, which drives 256 LEDs per channel. 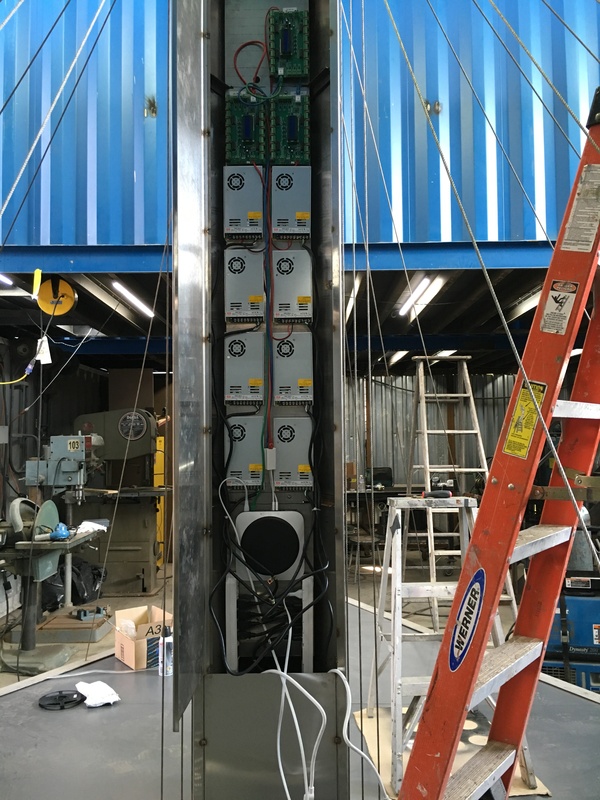 Using three of these controllers, we were able to drive the almost 7,000 LEDs in the installation. Additionally, we needed approximately 2,000 watts of power, so we bought 8x 5V 60A power supplies to drive all of the LEDs. 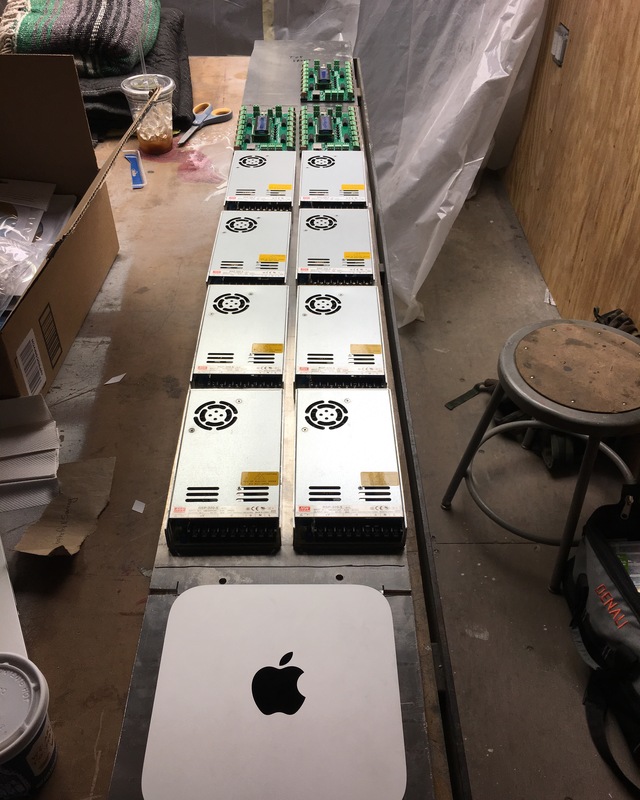 A Mac Mini running OpenFrameWorks was used to communicate with the LED controllers over ethernet. 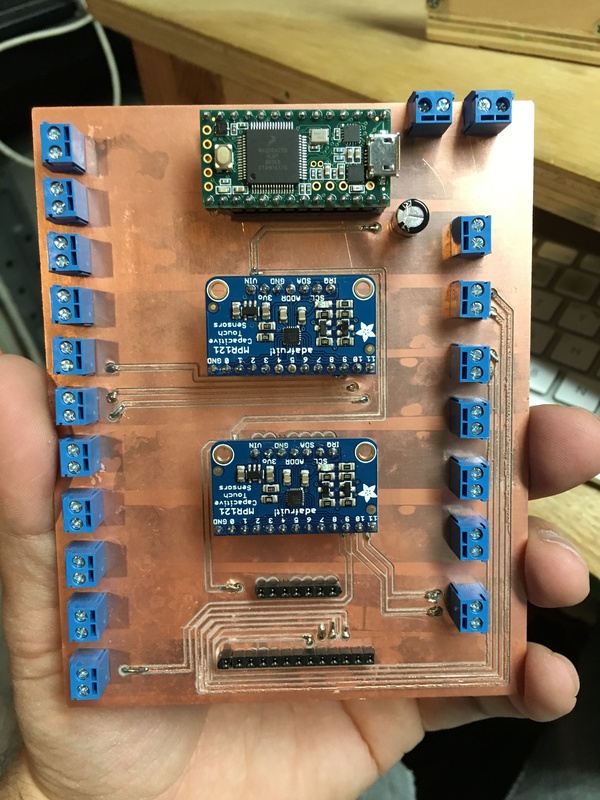 For the capacitive touch sensors, we used the Adafruit MPR121 board, which can sense up to 12 inputs. I designed a breakout board for three of these, plus a Teensy microcontroller to send the data to the Mac Mini. 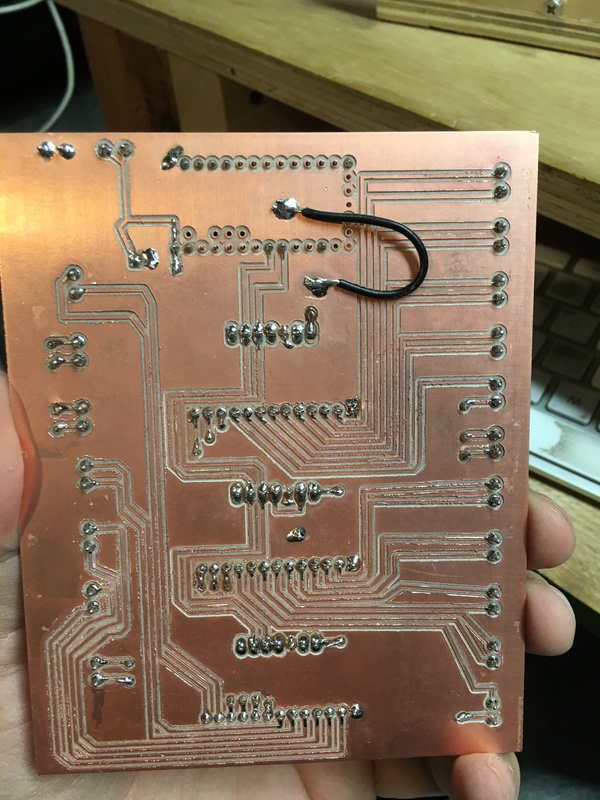 I was able to fabricate this board on the Othermill. 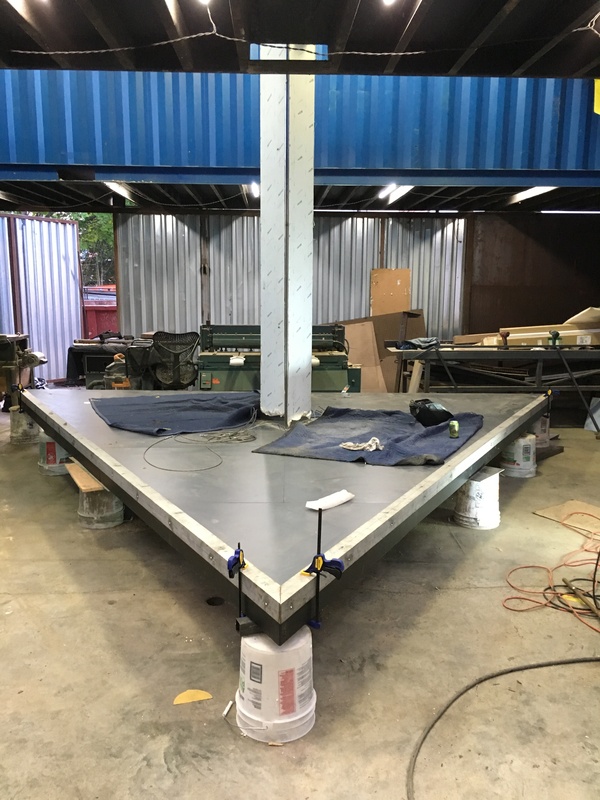 For the fabrication, we hired Dash 7 Design in Redhook to do the metal fabrication, and John Copjec to build the floor and install the laminate. 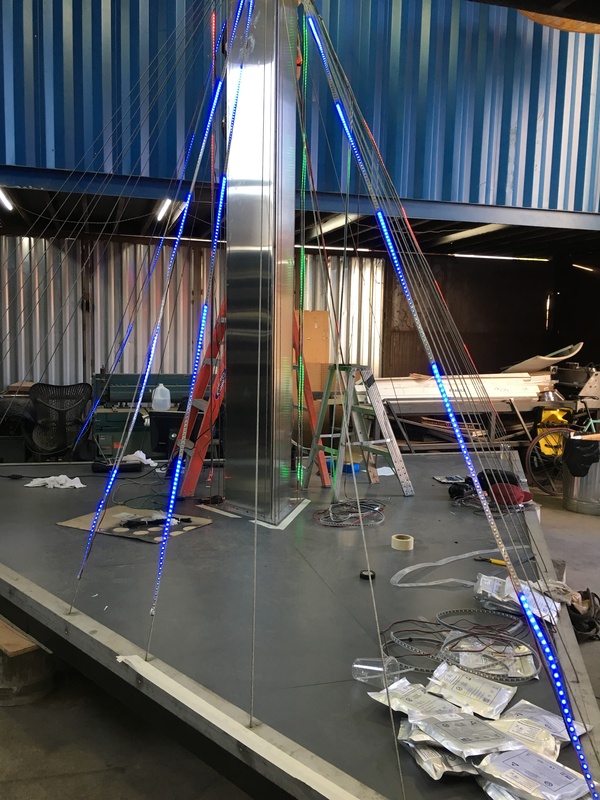 The LED strips were attached to steel cables that were tensioned from the column to rails around the perimeter of the floor. 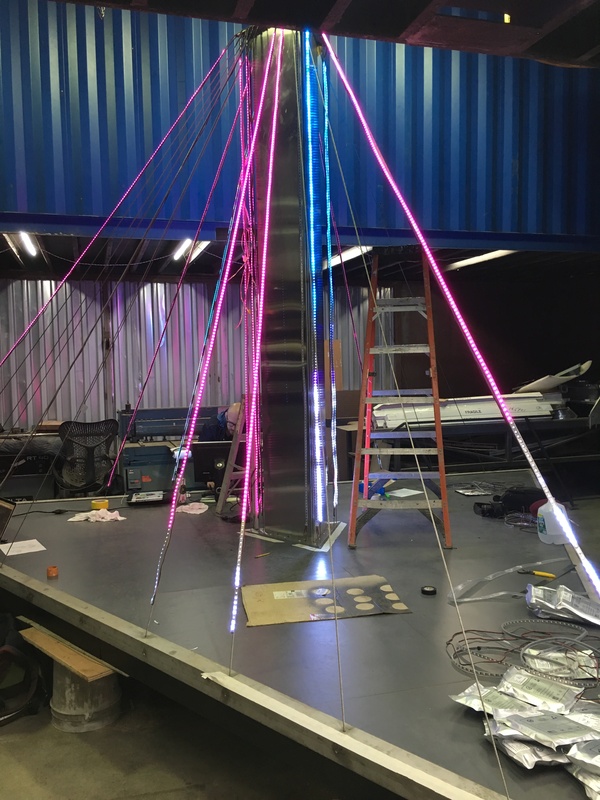 For diffusion, we used frosted acrylic tubes sleeved over the LEDs with an aluminum coupler to act as both the structural center as well as the capacitive touch sensor. 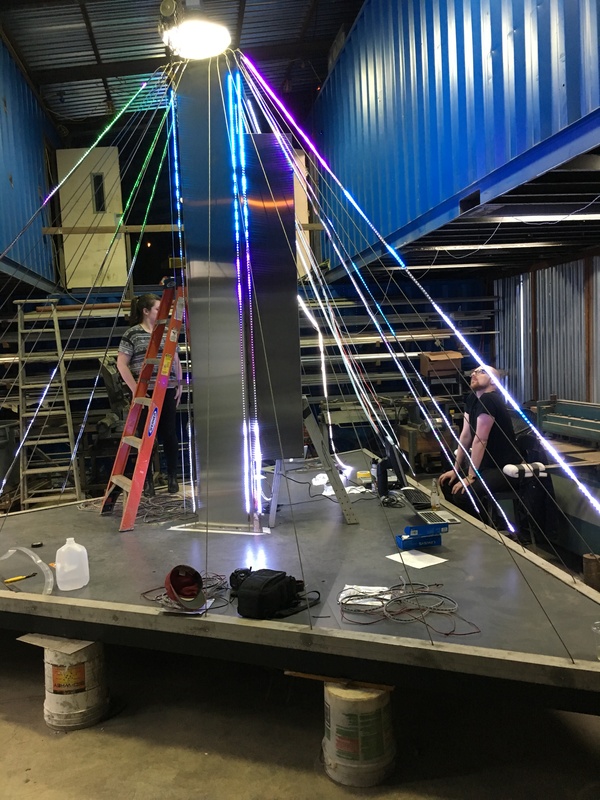 After a week of building and testing the sculpture in Redhook, we packed it into a box truck and transported it to Durham, North Carolina. 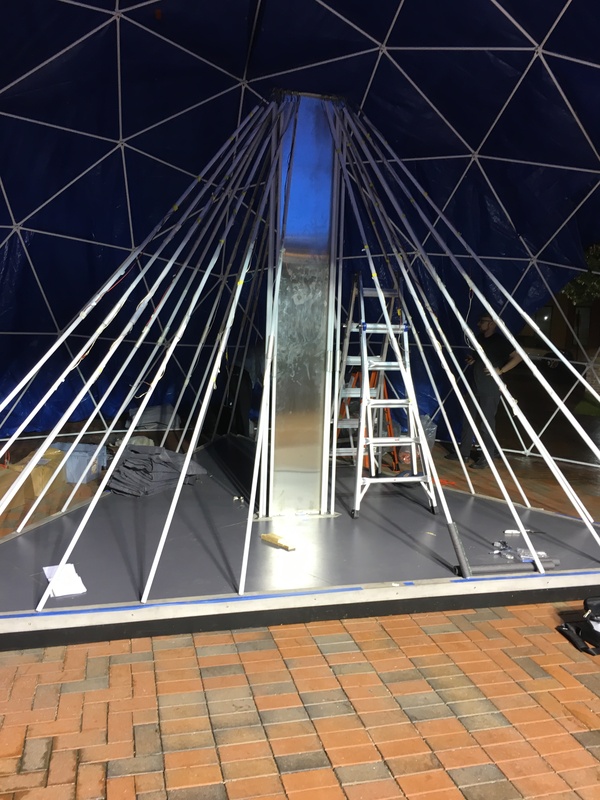 Because the sculpture was outdoors at CCB Plaza, we were able to enlist the Escape Collective to build a geodesic dome above the piece for the duration of the festival. #convergence #floatingpoint at #moogfest up and running! 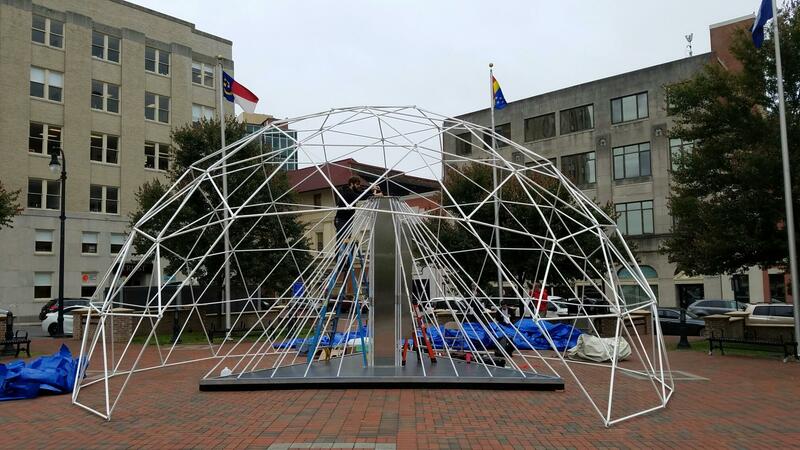 After the festival, we de-installed from CCB Plaza and moved the sculpture to RTP for the next year.